Dental implant overdenture therapy is a treatment modality with the potential of significantly improving the quality of our patients lives. In order to accomplish consistent and predictable treatment outcomes in general practice, an understanding of the fundamental principles of implant biomechanics, prosthetic, surgical and treatment planning considerations is required. Dr. Aldo Leopardi's objective for this presentation is to focus on advanced clinical techniques and concepts for overdenture and fixed restoration of the completely edentulous patient. Dental implant overdenture therapy is a treatment modality with the potential of significantly improving the quality of our patient's lives. In order to accomplish consistent and predictable treatment outcomes in general practice, an understanding of the fundamental principles of implant biomechanics, prosthetic, surgical and treatment planning considerations is required. 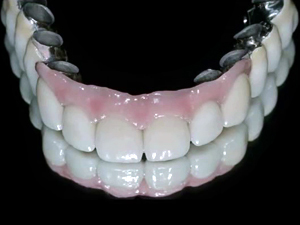 Dr. Aldo Leopardi's objective for this presentation is to focus on advanced clinical techniques and concepts for overdenture and fixed restoration of the completely edentulous patient.